Why is chiropractic care essential for Crossfit? Crossfit is intense. It exercises the body and pushes it to perform at its maximum ability. However, like any exercise (especially high-intensity exercise), you should take steps to prevent injury. Of course, taking time to warm up and ensuring your form is correct, will help you reduce the chance of injury. But, there is one more step to add to your routine: regular chiropractic care. You may think going to the chiropractor is only for adjustments and to relieve pain, but it’s more than that. Chiropractic care may actually increase your overall performance by giving you better range of motion and even improving your balance. It can also assist in helping you heal quicker. Chiropractors can help your body stay aligned and flexible to reduce injury. They can also assist you when you’re dealing with neck pain, back pain, or injuries. If you’re committed to putting your body to the test and keeping yourself in top notch shape, don’t disregard chiropractic care. Crossfit can push you to excel and to perform at a high level. However, as you’re pushing yourself to your limit, it can also lead to injury. 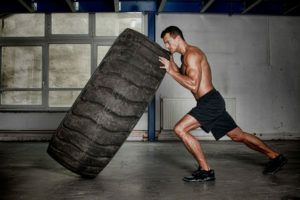 Just by practicing Crossfit, you’re showing how committed you are to staying healthy and fit. Just make sure you’re taking it a step further and taking care of your current and future health by practicing proper form and immediately addressing any issues with your chiropractor.